Book Review & Giveaway: You Are Not So Smart – Live, Love, Simple. 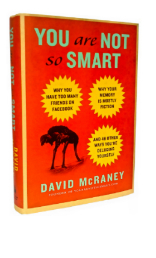 Recently, my friends at TLC asked me to review David McRaney’s new book, You Are Not So Smart: Why You Have Too Many Friends on Facebook, Why Your Memory Is Mostly Fiction, and 46 Other Ways You’re Deluding Yourself . I’ve always agreed with Socrates’ quote—As for me, all I know is that I know nothing—so the title of the book got my attention. Dunbar’s Number – Humans evolved to live in bands of roughly 150 individuals, the brain cannot handle more than that number. If you have more than 150 Facebook friends, they are surely not all real friends. Hindsight bias – When we learn something new, we reassure ourselves that we knew it all along. Confirmation bias – Our brains resist new ideas, instead paying attention only to findings that reinforce our preconceived notions. Brand loyalty – We reach for the same brand not because we trust its quality but because we want to reassure ourselves that we made a smart choice the last time we bought it. One of my favourite of the “lies” in the book is called the Normalcy Bias. The lie or misconception that most people have is that our fight-or-flight instincts kick in and we panic when disaster strikes. The truth is that most people actually become abnormally calm and pretend that everything is okay during a crisis. I had doubts about this idea, but David clearly illustrates the point through a couple examples. A small town gets warning of an incoming tornado. Instead of getting out of the way or seeking cover, many people choose to do nothing and lose their lives. An airplane that has just landed gets struck by another airplane also attempting to land. The top half of airplane one is torn off, a few passengers unbuckle & crawl out on the wing and to safety. But many of the passengers sit stunned in their seats. The airplane explodes. Again, the decision to do nothing costs them their lives. The book’s publisher has generously offered to giveaway one copy of the book to one of my readers (US/Canada only). If you’d like a chance to win—for yourself or as a gift—just leave a comment below. Be sure to leave your email so that I can be in touch if you win! I’m glad you enjoyed this one! Thanks for being on the tour. This sounds like an interesting book, and I’d love to read it. Thanks for the draw! Sounds like a great book to give to one of my family members for Xmas. I love the mix of pop culture and psychology. Hi Dena. I just stumbled onto your site today, and I love it! Thank you for sharing your journey from darkness to light with all those of us who are on the same path. The title of this book made me grin (thinking of a friend who would get a kick out of it) and your review intrigued me further. Thanks!